Location was great, close to all cafes, shops and restaurant, as well as the beach and marina. Bed was really comfortable. Rooms was a good size. Staff were amazing! The location was in close walking distance to restaurants and shops. Great for families as the park saw across the road. The location is great, right opposite the marina. It was also very quiet. The on site restaurant featured good food, friendly service, and alfresco dining near the swish condos and yachts. Haven Marina Glenelg This rating is a reflection of how the property compares to the industry standard when it comes to price, facilities and services available. It's based on a self-evaluation by the property. Use this rating to help choose your stay! One of our best sellers in Adelaide! 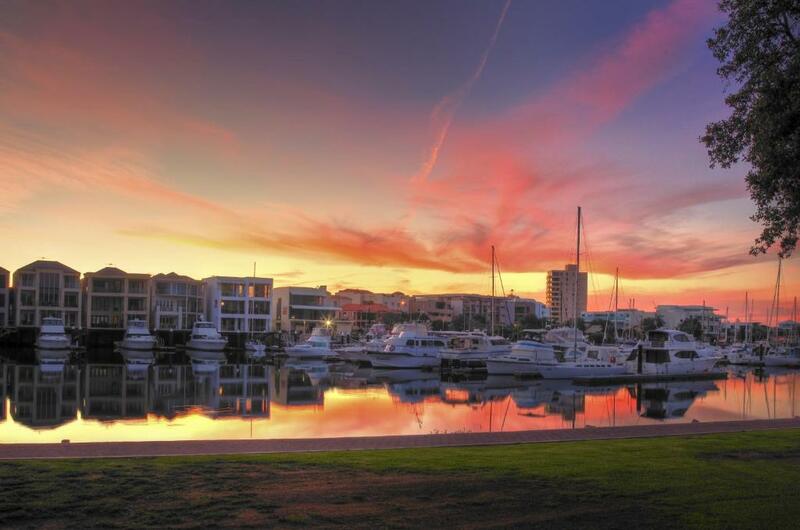 Haven Marina Glenelg is a boutique-style property in Glenelg, overlooking the Holdfast Shores Marina. Facilities include outdoor swimming pool, free WiFi and free parking. Please note that pets can be accommodated on request basis only and charges apply. Glenelg Beach is only a 2-minute stroll from The Haven Glenelg. It is a 10-minute walk to the shopping, dining and nightlife of Jetty Road, where trams depart every 20 minutes to Adelaide city center. All rooms have internet access, tea/coffee making facilities and a mini refrigerator. Guest laundry facilities are available on site, along with function and conference facilities. Just 5 minutes’ walk from the center of Glenelg, Haven Marina Glenelg is a 10-minute drive from Adelaide Airport and 20 minutes’ drive from Adelaide city center. When would you like to stay at Haven Marina Glenelg? This room includes a queen bed with a private bathroom. This room enjoys views of Holdfast Shores Marina and glimpses of the ocean. This spacious room is located around the courtyard and pool area. Comfort Inn Haven Marina is one of the most ideal locations for visitors being only 5 to 10 minutes from the airport, tram service to town, shopping precinct and the beach. Close to all the action but far enough away for a peaceful getaway. Area Info – This neighborhood is a great choice for travelers interested in beaches, relaxation and cafes – Check location Great location - show map Guests loved walking around the neighborhood! House Rules Haven Marina Glenelg takes special requests – add in the next step! Haven Marina Glenelg accepts these cards and reserves the right to temporarily hold an amount prior to arrival. Please note that the property is due to close on 30 December, 2019. Due to this closure, the property is only offering a light cafe style breakfast menu, 7 days a week from 7:00 until 10:00. There will also be reduced refurbishments/upkeep of the property as the property is closing. For more information, please contact the property using the contact details found on the booking confirmation. Please inform Haven Marina Glenelg of your expected arrival time in advance. You can use the Special Requests box when booking, or contact the property directly using the contact details in your confirmation. It was filthy and over priced and did not look anything like the website promoted it as. Our room had filthy floors and walls and a smell. We booked a pet friendly room and had to pay $50 cleaning fee but the room was already filthy. My shitzu was cleaner than the room. I had 2 nights booked and had to stay Night 1 as we had kids and had no other option that late in the night. the staff were helpful to cancel the 2nd night but after I showed them photos of the room they could not provide me with a discount or even a refund for the first night. I am emailing the photos today and will speak with the manager Friday when she is next in and will post a result here to what they did to address the issue. I have never complained about a room in 46 yrs. This was disgraceful! Room was only partly serviced each day. Towels were changed and only minimal toiletries were provided. Beds were NOT made, nor was the tea, coffee or milk in fridge refilled on any of the three days. Coffee cups and glasses were not replaced with clean ones either. Location was great. Reception welcome was good, professional and friendly. Bed was old.... sheets didn’t cover the bed..... room shabby..... staff disinterested. Great location. Easy check in and check out. A balcony door that wasn’t broken so you could slide it easily and maybe even lock it would have been handy. Queen size sheets for the queen size bed may be a good investment and would be far more comfortable for guests, it was a bit odd having a bottom sheet that only covered half of the bed. It isn’t very hygienic either. Smelly bathrooms, falsely advertised online.